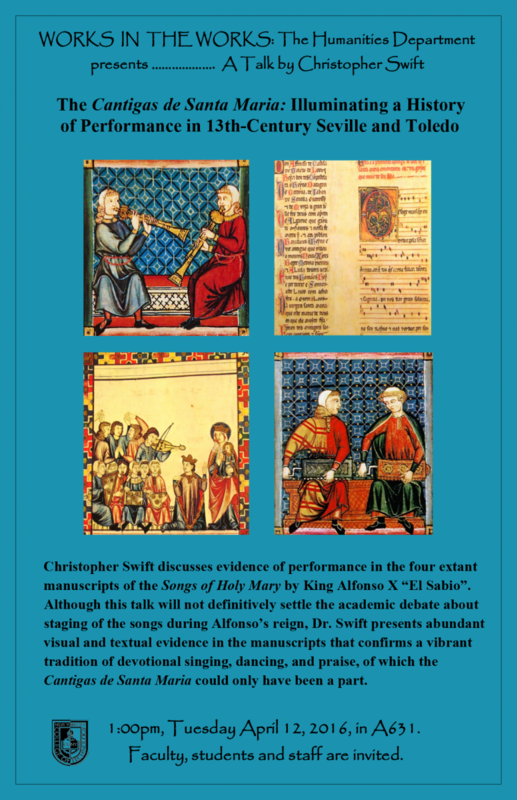 Christopher Swift discusses evidence of performance in the four extant manuscripts of the Songs of Holy Mary by King Alfonso X “El Sabio”. Although this talk will not definitively settle the academic debate about staging of the songs during Alfonso’s reign, Dr. Swift presents abundant visual and textual evidence in the manuscripts that confirms a vibrant tradition of devotional singing, dancing, and praise, of which the Cantinas de Santa Maria could only have been a part. I’m sure it will be an exciting event!